F&W's new Seasonal Muse series highlights a different ingredient obsession each month. For October, we chose squash and chefs around the country posted their best new squash dishes on Instagram using the hashtag #FWmuse. Browse the Seasonal Muse: Squash slideshow to see all their incredible takes on the colorful gourd. Chicago's Stephanie Izard (@stephandthegoat) shared a vibrant shot of squash with mushrooms (left). Philly's @pizzeriavetri, from Best New Chef 1999 Marc Vetri, showed us a fantastic pizza topped with oven-roasted butternut squash, ricotta and crispy sage. Chris Cosentino (@offalchris) is stuffing kabocha squash with oxtail in a new dish for two at Incanto in San Francisco. Matt Jennings (@matthewjennings) at Farmstead Inc in Providence created an heirloom squash salad with crispy ham. At @taldebrooklyn, "Samosas are back!!!" and chef Dale Talde is doing a filling of butternut squash. At Lincoln in New York, @jonathanbenno is turning out some tasty tortelloni di zucca with local cheese pumpkin. Marcus Samuelsson (@marcuscooks) previewed some roasted butternut squash. 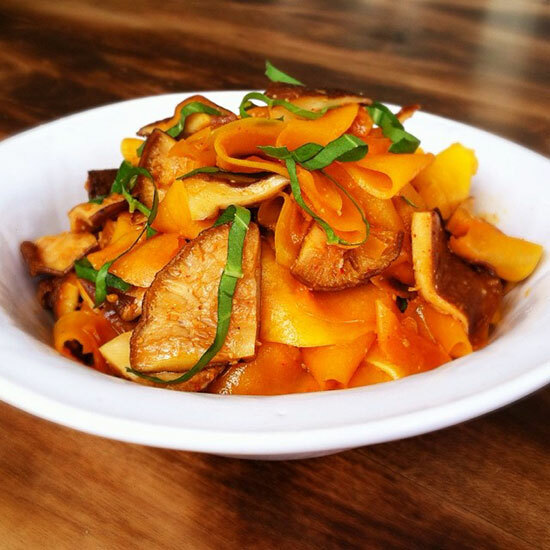 Downtown, @uncleboons's #thaifall includes kabocha squash noodles. And Tom Colicchio's New York restaurants—Colicchio & Sons (@colicchio_sons) in Manhattan and Topping Rose House (@toppingrose) in Bridgehampton—are both celebrating squash. For dessert, head to Buddakan (@starrrestaurant) for kabocha squash doughnuts with Chinese five spice. Even @chobani's Soho Café has pumpkin fever. Their pie-inspired seasonal parfait combines plain yogurt with housemade pumpkin custard, toasted pecans, crushed gingersnaps, dried cranberries and spiced maple syrup. You can take part in Seasonal Muse, too. This November, we're focusing on apples. So post all your best apple dishes and apple inspiration on Instagram with the hashtag #FWmuse and our handle @foodandwinemag.